Now that Dorothy has let the cat out of the bag – though I am not sure that it was ever in – you all know that I love beads. Love to look at them, collect them and knit with them! 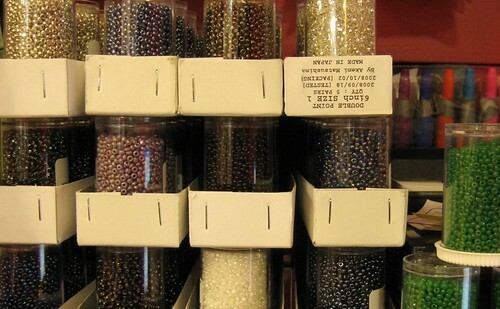 Because of this interest – obsession – Emily has brought some beads into the store. Let me introduce you to our new stock! The size of bead that I find most useful for knitting are the 8/0’s. With beads the larger the number, the smaller the bead. I like the 8/0’s because they show up nicely but do not add too much weight to the item knit and can be applied every way that it is possible to use beads in knitting. The 8/0’s can be are hard to find. The larger bead 6/0 is also popular, especially when using a crochet hook to apply the beads, but they are far easier to find than the 8/0’s. We currently have 13 colours, they are sold in medium size vials, with approx 2100 to 2600 beads in each vial. Beads are usually sold by weight and the size is not always perfect, therefore the range in numbers. 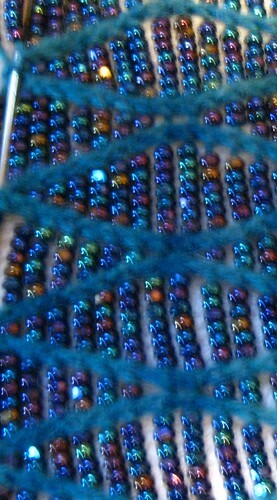 Three of the colours are basic beads. They are the clear mirrored, smoke mirrored and the white mixed (a mixture of white, pearl, and white opalescent). The other beads are “Charlotte’s”. Blue AB Charlotte’s – Up Close and Personal! What are Charlotte’s? They are beads with one cut surface. This adds to the “sparkle”. The cut catches the light and really shows up as a glitter in the knit. The colours in the Charlotte’s include, Brown AB, a metallic mix; Blue AB, an irredescent peacock blue mix; Grey Iris, Mauve Iris, Metallic Silver, Dark topaz, Dark purple, Jade green, and Gunmetal Grey. Why knit with beads? They add light, colour and drape to your knitted fabrics. They can highlight a feature and create interest in anything that you knit. Look for some beading classes come the spring – Yes, Dorothy and I are already planning the Spring classes. We have lots of cool ideas to share with you!